When: Monday 24 7:30 at Massey Theatre – tickets at the door $9. On an afternoon in 1983, Eric Lomax (Colin Firth), a quiet, middle-aged radio and railway enthusiast meets bubbly Patti (Nicole Kidman) on a Scottish train. Their courtship is quick and a wedding soon follow, but on their wedding night, Patti finds that her groom has terrible nightmares that almost immobilize him and he won’t explain why. 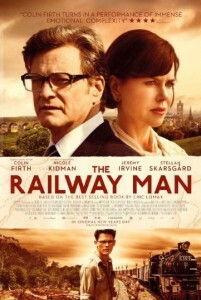 Patti turns to Eric’s friend Finlay (Stellan Skarsgård), who tells her Eric’s secret: during WWII, along with thousands of other British soldiers captured by the Japanese, Eric was forced to work on the construction of the Thailand-Burma Railway—the so-called Death Railway. When a secret radio he built was discovered, he was brutally tortured by a Japanese officer. Though it’s decades later, Eric discovers the Japanese interpreter who tormented him is still alive and sets out to confront him in an effort to put closure on his haunted past. Based on the bestselling memoir by Eric Lomax.